During our three part series on the California Water Crisis we have explored California’s water infrastructure history, sources, storage and some of the problems we are facing in the Central Valley. In our third installment we explore some of the solutions, actions, and steps we are taking to mitigate the effects of drought and how our farmers are preparing for the upcoming summer season. As explained in our previous water problem issue, current regulations & legislations have drastically reduced the amount of water sent to the Central Valley. Over 3.8 million-acre feet of water from the Central Valley Project and the State Water Project has been re-prioritized away from cities & farms for environmental projects and environmental regulatory requirements. Since 1992, farmers have been receiving on average 35% of the water that they were originally allocated. This year our farmers have been told to expect 0% of the water originally allocate to them from the projects. It is not just our farmers that are feeling the negative effects of the current water allocation. Famers in rural areas and smaller communities all over the state are in direct competition with the urban population that has an overwhelming advantage when it comes to votes. Agriculture is a $44.7 billion dollar industry in California, providing the world with over 400 different commodities throughout the year. The current water allocation regulations, environmental regulation requirements order for California, especially the Central Valley, need to be reexamined to provide flexibility in environmental regulations. Protecting our natural ecosystem is extremely important but there should be some flexibility in the regulation that’s required for the environment, especially when are in such a state of drought. In 2009, California adopted the California Water Action Plan through the passage of the Senate Bill 7×7. Once of the plan’s short-term goals is to reduce urban per capita water usage by at least 10% before December 31, 2015. The plans long-terms goal will require California to reduce per capita water usage by 20% before December 31, 2020. To achieve these short and long-term goals, the Water Conservation Act promotes expanding the development of sustainable water supplies, agricultural water management plans, and efficient water management practices for agricultural water suppliers.Cities all over California are making water conservation a priority for community members and visitors. A great example of this is in a small town called Cambria on the Central Coast. Cambrians are using only recycled water for their gardens, restaurants will only serve water if requested, and public restrooms have been replaced with port-a-potties. California’s water infrastructure is working hard to provide our communities and farms with precious water. With the last major water project being completed in the 1970’s, the infrastructure is beginning to show its age. Investments in our statewide water system need to match the current state of California’s agricultural demands and growing population. 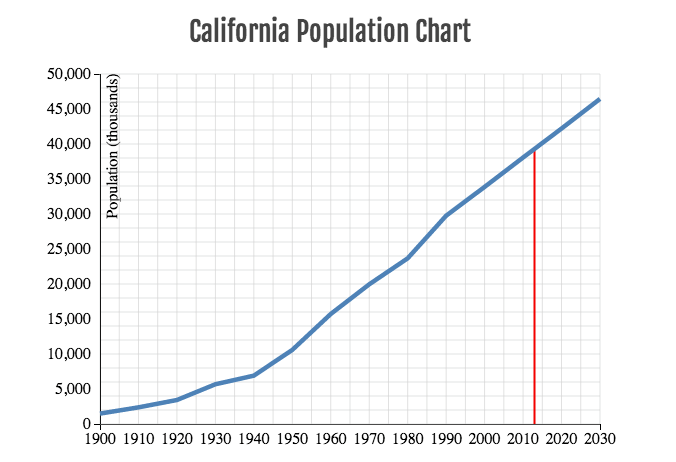 At the time of the last official consensus in 2010, California’s population was approximately 37.3 million people and could easily exceed 40 million by the 2020 consensus. Our water infrastructure (pipe systems and other hardware) desperately needs to be updated in order to meet the ever-growing demand. The 2014 Water Bond, if passed in November 2014, could provide an $11.4 billion dollar general obligation bond to fund programs and projects to address California’s water supply issues. The bond would help to fund large-scale investments in infrastructure (water storage capacity, recycling facilities, levee improvements, flood control facilities, and water treatment plants) to help improve water supply reliability in dry times and help to store a greater amount of water when it is available. The bond will also provide funding for ecosystem restoration and habitat improvements. Hot temperatures and dry conditions also increase the likelihood of forest fires here in the California. CAL FIRE is preparing for this summer by hiring hundreds of additional seasonal firefighters to be station all throughout the state. By taking steps to prevent wildfires and being prepared to respond quickly, our firefighters will be able to conserve our already scarce water resources. Just like smoky the bear told you, only you can prevent forest fires! For more information on how you can prevent & prepare to wild fires, visit ReadyForWildfire.org. Our farmers have generation of experience and knowledge behind them. This knowledge and experience has given them the ability to adapt to tough situations and make the most of out of a limited supply of resources. Adapting to a limited water supply means figuring out how to efficiently use and conserve water. Jeff Bortolussi, a Summeripe farmer, said “Water conservation is foremost in our minds. Water used to not be a thought for us, but now it’s a very serious situation”. Our farmers are taking advantage of technology to help them conserve water and use what water they do have as efficiently as possible. They are using instruments like Irrometers Tensiometers to figure out what will be the most effective use of water. Irrometers Tensiometers directly measure the amount of water in any given amount of soil and the physical force that is actually holding water in the soil. The situation that California is in is terrible without question but we are actually pretty lucky here in the Reedley area. We have a few important factors that are working for us, not against us. We are allowed to drill new wells to reach water tables in the ground. Some farmers on the West side of the Central Valley are not allowed to drill for new wells. We are also extremely fortunate here on the East side that the Kings River feeds our water tables with good quality water. Our water tables are also relatively shallow, meaning that it is a not as expensive for our farmers to drill wells and pump the water out. Good quality water at shallow levels is great because ground water is currently the only source of water for our farmers. Our landscape is also another positive factor for our farmers. The flat landscape allows our farmers to choose the most efficient irrigation method. They will often choose to use a drip irrigation system or use a technique called “flood” irrigation. Flood irrigation not only provides the trees with water it also provides an opportunity for the water tables to be replenished with the excess water the trees did not need. Drip irrigation uses drip lines to provide their trees with the exact amount of water needed. Drip is great for conservation because the trees get exactly what they need, but you can never use surface water (which takes from the water table) and it doesn’t replenish it like flood does.